The collection of the Museum Ludwig comprises the most important stages and positions in the development of 20th century art and contemporary art. Roy Lichtenstein's "Maybe", Andy Warhol's "Brillo Boxes" and George Segal's "Restaurant Window", all icons of American Pop Art, had just been completed when in 1969 they were included as loans in the collection of the Wallraf-Richartz-Museum. The works came from Peter and Irene Ludwig who have built up the biggest collection of Pop Art outside the USA. 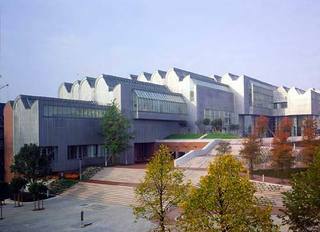 In 1976 the Museum Ludwig was founded with a gift of 350 works of modern art by the Ludwigs. It was to be the first museum in Cologne to exhibit contemporary art. Apart from pop art the Ludwigs also donated a large collection of Russian Avantgarde from the period 1906 to 1930 and a voluminous collection of several hundred works by Pablo Picasso as a permanent loan. The works by Picasso have meanwhile become the property of the Museum Ludwig thanks to two generous gifts in 1994 and 2001. The modern section of the Wallraf-Richartz-Museum with the collection of expressionists of the Cologne advocate Josef Haubrich formed the basis of the collection of contemporary art and was also integrated into the Museum Ludwig. The museum has continued to systematically collect contemporary art. New acquisitions were often only a few months old when they were bought. Thus German art from the 70s and 80s, international trends and installations by the younger avantgarde also found their way into the collection of the Museum Ludwig. The building designed by the architects Peter Busmann and Godfried Haberer was opened in 1986. It is located between the Cathedral, the river Rhine and the main station. It housed the Wallraf-Richartz-Museum, the Museum Ludwig and the Philharmonie. In January 2001 the Wallraf-Richartz-Museum moved into its own building so that 20th century and contemporary art now have roughly 8000 sq. metres of exhibition space at their disposal. Kasper König has been director of the museum since November 2000. His name is associated with major exhibitions such as "Westkunst", "von hier aus" and "skulptur.projekte Münster". He is concerned to promote a dialogue between visitors and works of art by making use of the project rooms AC: and DC: and by staging numerous events. "The museum should be used, not visited, as it belongs to everyone and no-one."